Palmistry According to Aristotle. Aristotle's Treatise, Masterpiece. 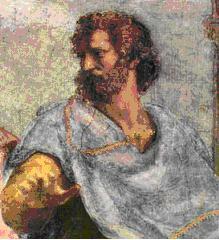 Homer was reputed to have written a treatise "On the Lines of the Hands" however, this supposed work has not survived although it has been referred to by later writers. Although many handreaders claim that Aristotle used and wrote about palmistry, this has never been substantiated. An English translation of Aristotle's Masterpiece was published in 1738 in London and included a Treatise on Palmistry, supposedly written in 350 BC by Aristotle. Even though the treatise does not originate from Aristotle, the treatise certainly offers the knowledge that was available in the early 1700's. This supposed treatise by Aristotle on palmistry was included by William G. Benham in his book, The Laws of Scientific Handreading, in 1900. The following text is the translation in full, written in the English of the 18th century. Being engaged in this third Part to shew what Judgments may be drawn according to Physiognomy, from the several Parts of the body, and coming in Order to speak of the Hands, it has put me under a Necessity of saying something about Palmestry, which is a Judgment made of the Conditions, Inclinations, and Fortunes of Men and Women, from their various Lines and Characters which Nature has imprinted on the Hands, which are almost as various as the Hands that have 'em. And to render what I shall say the more plain, I will in the first place present the scheme or Figure of a Hand, and explain the various Lines therein. Which is the nimblest Planet of 'em all. I now proceed to give Judgment from these several Lines: And in the first place take notice that in Palmestry the left Hand is chiefly to be regarded; because therein the Lines are most visible, and have the strictest Communication with the Heart and Brains. Now having premised this, in the next place observe the Line of Life, and if it be fair, extended to its full length, and not broken with an intermixture of Cross Lines, it shews long Life and Health; and it is the same if a double Line of life appears, as there sometimes does. When the Stars appear in this Line it is a Significator of great Losses and Calamities: If on it there be the Figure of two O's or a Y, it threatens the Person with Blindness: If it wraps itself about the Table-line, then does it promise Wealth and Honor to be attained by Prudence and Industry. If the Line be cut or jagged at the upper-End, it denotes much Sickness. If this Line be cut by any Lines coming from the Mount of Venus, it declares the Person to be unfortunate in Love and Business also, and threatens him with sudden Death: a Cross between the Line of Life and the Table Line, shews the Person to be very liberal and charitable and of a noble Spirit. Let us now see the Significations of the Table-line. The Middle-line. This Line has in it oftentimes (for there is scarce one hand in which it varies not) divers very significant Characters: many small Lines, between this and the Table-line, threaten the Party with Sickness, but also give him hopes of Recovery. A half cross branching into this Line, declares the Person shall have Honour, Riches, and good Success in all his Undertakings. A half Moon denotes cold and watery Distempers; but a Sun or Star upon this Line, promises Prosperity and Riches; This Line double in a Woman, shews she shall have several husbands, but without any Children by them. The Line of Venus, if it happens to be cut or divided near the Fore-finger, threatens Ruin to the party, and that it shall befal him by means of lascivious Women, and bad Company; Two crosses upon this Line, one being on the Fore-finger, and the other bending towards the little Finger, shews the Party to be weak, and inclin'd to Modesty and Virtue; indeed it generally denotes Modesty in Women, and therefore those who desire such Wives, usually choose them by this Standard. The Liver-line, if it be strait, and cross'd by other Lines, shews the Person to be of sound Judgment, and a piercing Understanding: But if it be winding, crooked, and bending outward, it shews Deceit and Flattery, and that the Person is not to be trusted. If it makes a Triangle [shape of a triangle], or Quadrangle [shape of a Quadrangle], it shews the Person to be of noble Descent, and ambitious of Honour and Promotion. If it happens that this Line and the middle Line begin near each other, it denotes the Person to be weak in his Judgment, if a man; but if a Woman danger by hard Labour. The Plane of Mars being in the hallow of the Hand, most of the Lines pass through it, which render it very significant. This Plane being hallow, and the Lines being crooked and distorted, threaten the Party to fall by his Enemies. When the Lines beginning at the Wrist, are long within the Plane, reaching the Brawn of the Hand, they shew the Person being one giving to Quarelling, often in Broils, and of a hot and fiery Spirit, by which he shall suffer much Damage. If deep large Crosses be in the middle of the Plane, it shews the Party shall obtain Honour by Martial Exploits; but if it be a Woman, that she shall have several Husbands, and easy Labour with her Children. The Line of Death is fatal, when any Crosses or broken Lines appear in it; for they threaten the Person with Sickness and a short Life. A clouded Moon appearing therein; threatens a Child-bed Woman with Death. A bloody Spot in the Line denotes a violent Death. A Star like a Comet threatens Ruin by War, and Death by Pestilence. But if a bright Sun appears therein, it promises long Life and Prosperity. As for the Lines of the Wrist, being fair, they denote good Fortune; but if crost and broken, the contrary. Thus much with respect to the several Lines of the Hand. Now as to the Judgment to be made from the Hand itself; if the Hand be soft and long, and lean withal, it denotes the Person of a good Understanding, a Lover of Peace and Honesty, discreet, serviceable, a good Neighbour, a Lover of Learning. He whose Hands are very thick, and very short, is thereby signified to be faithful, strong, and labourious, and one that cannot long retain his Anger. He whose Hands are full of Hairs, and those Hairs thick, and great ones, if his Fingers withal be crooked, is thereby denoted to be luxourious, vain, false, of a dull Understanding and Disposition, and more foolish than wise. He whose Hands and Fingers do bend upwards, is commonly a Man liberal, serviceable, a Keeper of Secrets, and apt to his Power (for he is seldom fortunate) to do any Man a Courtesie. He whose Hands are stiff, and will not bend at the upper Joynts near to his Finger is always a wretched, miserable Person, covetous, obstinate, incredulous, and one that will believe nothing that contradicts his own private Interest. And thus much shall suffice to be said of Judgments in Physiognomy concerning the Hands. Whene'er he finds he does from Virtue stray.